At Hensmans, we are committed to protecting and respecting your privacy. This policy explains how, when and why we collect personal information and how we use it and keep it secure. What information is being collected, and when? When clients come for an appointment, we collect their name, postal address, contact phone numbers, email addresses, and date of birth. We also make a record of any allergies and skin tests for clients having a colour service. When a client registers for our online booking system, we collect their name, email address and phone number, which is added onto our client database. When we hold external events, we collect email addresses from attendees so we can send out new client vouchers and offers, however people are asked if they wish to receive these and we only send to those that opt in to receiving email communications from us. Our salons are monitored by CCTV. Why is the data being collected? Occasionally we may need to contact you about an upcoming appointment. For example, to make you aware of your stylist being unwell or an issue beyond our control that requires the appointment to be rescheduled. We will always ask for your preferred mode of contact for these occasions, and you are free to change this at any time. We ask to collect your mobile number so that we can send you appointment reminders via text message; we always ask if you would like these reminders and do not send them unless you consent to them, and you are free to withdraw your consent at any time. We make a record of any allergies and skin test results as we are legally required to by both our professional federation and our contractual agreements with our product manufactures, so this is carried out on the lawful basis of our contractual obligations. We also ask for your explicit consent to store this information for one year. We ask for your date of birth as there are some services we can’t offer to under 16’s, in line with our professional code of conduct. We also require confirmation of the age of young people, as children under 12 are required to be supervised in the salon by a parent, so processing this information is on the lawful basis of our legitimate interests as a business. We also ask for you date of birth as we like to be able to email you a birthday voucher; we will always ask if you consent for us to do this and you are free to withdraw your consent at any time. We like to keep you up-to-date with our news, offers and events via email and/or post; we will always ask if you consent for us to do this and you are free to withdraw your consent at any time. We have CCTV cameras in the salons for security reasons. They also provide us with the opportunity to monitor the running of the salon at all times to identify any possible Health & Safety issues so that we can address them as soon as they arise, so we conduct this monitoring on the lawful basis of our legitimate interests as a business. We will not share, sell or rent your data to any third parties. We will not share your information with third parties for marketing purposes. We store all client information on our secure database that is password protected, which is backed up to an encrypted, password protected cloud storage system. CCTV footage is securely stored and password protected for 30 days, after which time it is deleted. Your data will be kept securely until you notify us that you no longer wish to receive our communications, or after 2 years from your last salon visit, whichever is sooner. We are committed to ensuring the accuracy of your information, and regularly check the details we have are correct. If you change any details that we hold, please notify us by either phone on 01604 634448, email northampton@hensmans.co.uk or write to us at 7-9 Kettering Road, Abington Square, Northampton NN1 4AJ. You have the right to determine whether or not you wish to receive information from us. If you do not wish to receive communications from us by post, email or phone, in the first instance, you can notify us of that by not opting in on the client contact form in salon. You can also change how you would like us to contact you by letting reception or your stylist know at any time. If you would like us to delete all your contact information, please contact Caroline at caroline@hensmans.co.uk or on 01604 634448. If you want to complain about communications you receive from us, you can email us at julie@hensmans.co.uk or call us at 01604 634448. If you think that we have misused your data, you can also complain to the Information Commissioner's Office at any time. Please give 48 hours’ notice of a cancellation. Failure to do so will incur a cancellation charge. All Hensmans offers and promotions are limited to one per person and are only available on one service per visit – they are not valid in conjunction with any other offer. We will attempt to publicise such information, but cannot be held responsible for any error in doing so. On occasions when client is not satisfied with the outcome of any colour service after confirming the colour during consultation, Hensmans Salons reserves the right to decide whether to provide a repair service. Please inform your stylist/therapist if you are pregnant, taking medication, have allergies or any other medical condition that may affect you during your time in the salon. Personal valuables are your own responsibility. We cannot accept liability for loss or damage so please take care. No responsibility can be held for items left on the premises. All clients are required to have an allergy test before any have a colour service. You will be asked to have a test a minimum of 48hrs prior to your first colour service and then on an annual basis thereafter. All children under the age of 12 must be supervised in the salon at all times by a parent or guardian. Student discounts, Kids club and the post colour blow dry offers are only available Monday-Friday and are with selected stylists only and are subject to availability. Hensmans salons reserve the right to change, amend or withdraw any offer, promotion, or these terms and conditions,at any time without prior notice and at their discretion. All Hensmans offers are available with selected stylists only, subject to availability and not to be used in conjunction with any other offer. Hensmans reserve the right to change or cancel any offer at any time. No cash alternative is available. Unless otherwise stated offers to do not apply to Kids club appointments. Hensmans reward points are accumulated with every purchase of salon services and can be redeemed against either salon services of products. To collect points for a transaction, your Hensmans reward card must be presented at the till. Reward points cannot be used in conjunction with any other offer and they have no cash value. The Hensmans reward cards are issued by, and remain the property of, Hensmans Salons. Only one reward care per person. Some purchases may be excluded from the scheme at the discretion of Hensmans Salons. Hensmans Salons reserve the right to alter or amend the terms & conditions of the Reward Card scheme, or terminate the Reward Club at any time. Gift cards cannot be exchanged for cash or resold. Gift cards must be used against salon services only and presented in the salon when payment is due. Hensmans gift cards are valid for 12 months from the date of purchase. Gift cards must be produced in person to be redeemed. Hensmans gift cards can be used in full or part payment salon services or products. Where a Gift card holder wishes to buy salon services or products with a value higher than the balance on the gift Card, they will be required to pay the difference in value. If a Gift Card is lost, stolen or damaged Hensmans Salons cannot replace or reimburse the balance on the gift card. Only one entry per person. Winner will be chosen at random by an independent party. Prize will available for collection after the closing date. Prizes are not transferable and cannot be exchanged for cash or resold. Entrants are required to meet the Entry Criteria but otherwise no other purchase is necessary. Prize winning gift vouchers can only be used for salon services, and they not redeemable against retail products. Employees of Hensmans (and their respective families) are not eligible to enter. No responsibility is accepted for entries which are lost, corrupted, incomplete or for any failure to capture entry information. Hensmans reserves the right to cancel or amend the competition or rules without notice. The decision of the judge(s) is final and no correspondence or discussion shall be entered into. Wherea winner has been selected and Hensmans has reasonable grounds to believe a winner has made more than one entry, we reserve the right to select an alternative winner. Hensmans cannot accept any responsibility for any damage, loss, injury or disappointment suffered by any entrant entering the competition or as a result of accepting any prize. Hensmans reserves the right to use the names of winner in any online publicity. Corporate members – The Hensmans corporate club membership is exclusively for businesses. It provides a 15% discount on all salon services, for all nominated staff that work within a business. 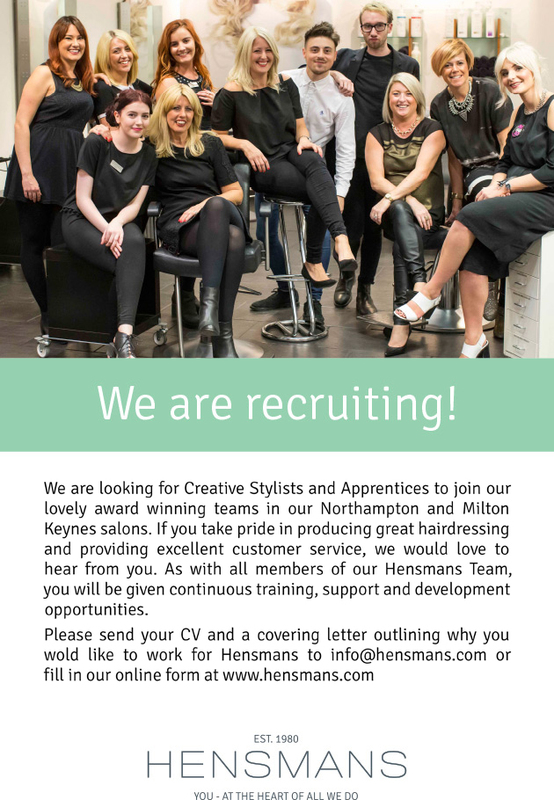 A minimum of 5 employees are required for a company to qualify to join the Hensmans Corporate club. Members must present their corporate club card at every appointment to receive their discount. The Corporate club discount cannot be used in conjunction with any other offer, discount or against products. Members are required to notify Hensmans of any change of employment. Hero members – Individuals that work within the Public sector (Fire, Police, Teachers & NHS staff) are known as Hero Members of the Corporate Club. The Corporate club provides a 15% discount on all salon services. Members must present their corporate club card at every appointment to receive their discount. The Corporate club discount cannot be used in conjunction with any other offer, discount or against products. Members are required to notify Hensmans of any change of employment. Our priority is for you to be completely satisfied with the service you receive from us. We run a professional business so we aim for the highest standards in everything we do. Complaints are rare but we take them seriously, so we have a complaints policy and process we follow to make sure things are put right where needed and we learn from your feedback. Tell someone you’re not happy with the service you’ve received, either while you’re in the salon / barbershop or as soon as possible after leaving. Calmly and clearly explain the problem. We will listen to your feedback and ask questions as necessary to understand why you are making a complaint. We aim to resolve all complaints within 8 weeks. If you have already left the salon / barbershop, don’t go to another salon as we have the right to see exactly what the service or treatment you received from us looks like. We will arrange a suitable time for you to come back into our salon and discuss your complaint in private. Where we think your complaint is reasonable, we will redo the part or all of the service or treatment again as soon as possible, free of charge. The work will be done by a different stylist, barber or beauty therapist if you prefer, although this may not be possible if the individual is self-employed. If, after following our complaints policy we still can’t agree on how to resolve the complaint to your satisfaction, as required by the Consumer Rights Act 2015 we will refer you to a certified alternative dispute resolution provider, Small Claims Mediation Ltd. They are mediators, an independent third party which listens to both sides and helps us both work towards a fair and reasonable compromise which, if agreed, becomes legally binding. It is a cheaper alternative for you than taking legal action. We will participate in a one hour session at a mutually time to be agreed with Small Claims Mediation Ltd. Please note there is a charge of £50+VAT for the salon and £50+VAT for you as the client.